At the time I wrote Giant Clams in the Sea and the Aquarium (2006), Tridacnacrocea, T. maxima, T. squamosa, T. derasa, T. gigas, Hippopushippopus, and H. porcellanus had been imported for the US reef aquarium hobby. It’s time for some updating though, as another species, T. mbalavuana (tevoroa) has now been imported here, and three new species have been described. Of these three, T. squamosina (costata) was the first new one, so I’ll give you some information on T. mbalavuana and this species, and cover the other new species in a follow-up article. While doing surveys of giant clam populations in Fiji in 1985, a few unusual giant clams were found, which got the attention of researchers. The clams were similar to T. derasa, but distinguishable, and after more were collected and studied it was suggested that they might represent a new species. Of course, the locals had already noticed this clam and had named it the devil clam, which is tevoro in Fijian. So, at first it was just called the tevoro clam, and subsequently named Tridacnatevoroa.1,2,3 However, it was later found that this clam had been previously described and named T. mbalavuana in 1934, albeit based only on shells/fossil specimens.4 So, T. tevoroa became a junior synonym of T. mbalavuana. Approximate geographic range of T. mbalavuana. Redrawn from Ledua, et. al. (1993). 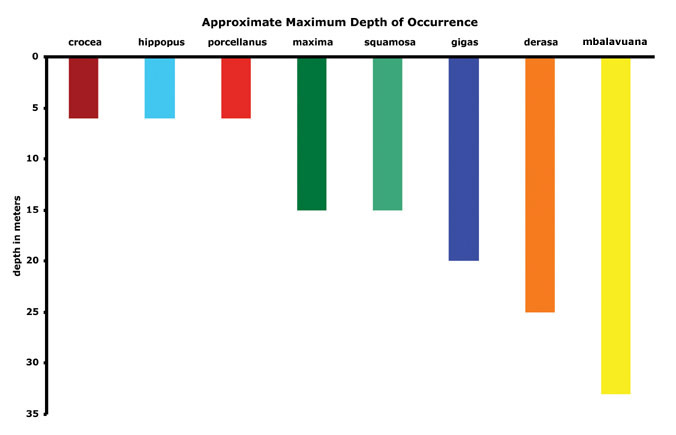 Approximate maximum depth of occurrence of T. mbalavuana vs several other tridacnid species. As far as looks go, the shell is grayish-white, and often bears unusual red patches/bands near the bottom. H. hippopus also bears red markings on its shell, but these are often obscured by the growth of coralline algae, sponge, etc. on the shells of both species. The shells of H. hippopus also bear red markings, which are especially prominent on smaller specimens. Typical shell form of T. mbalavuana. Illustration by Laura Hamilton. Note that the shell of T. mbalavuana can look very similar to those of some T. derasa. Two such T. derasa pictured here, from the Great Barrier Reef. The fleshy upper mantle tissue comes in a variety of looks. It’s often rather dull gray to brownish-gray without colorful or fancy markings, but some are quite attractive, as you can see below. There are three things that are particularly unusual about its mantle, though. It always has a rugose texture, being very knobby/lumpy looking, and it extends very little past the edge of the shell, or not all. Instead of extending it further, the shell gapes open widely and thus exposes a relatively large amount of the mantle anyway. Three specimens of T. mbalavuana. Used with permission, courtesy Dr. Richard Braley (aquasearch.net.au) (L), and Ecological Reef Farms Tonga (M & R). When it comes to this species and the reef aquarium hobby, as I said above, there has been at least one specimen imported into the US . In February of 2015, Ecological Reef Farms Tonga collected the specimen on the above right and shipped it to a dealer here. Apparently it has an expected retail price tag of $2,000. 8 That’s a lot of money for a clam, of course, but I’ve seen a large blue T. squamosa sell for more than twice that. This species was also successfully aquacultured at the Tonga Fisheries hatchery in the early 1990’s, although it was problematic and not many clams were produced.9 Still, with a price (and profit) like that, and a proven ability to farm them, regardless of problems, I think there’s a good chance that more will become available in the future. Considering their paucity on the reefs, and relatively small geographic range, I certainly do not think any significant quantities of them will be collected from the wild, though. In the event that more are imported, I’ll offer some care advice. Considering that this species is typically found in relatively deep water, it is important to give any specimen time to acclimate to intense reef aquarium lighting. The mantles of giant clams contain structures called iridophores that are made of small groups of cells called iridocytes, which contain stacks of tiny reflective platelets. These can serve multiple functions, but one of them is to help block damaging ultraviolet light. Mycosporine-like amino acids ( MAAs) are also found in the mantle and serve the same purpose, along with some non-photosynthetic pigments. Still, in the case with other giant clams, specimens from dimmer waters can typically be slowly acclimated to brighter light over a period of a few weeks, giving them time to produce various materials for dealing with the increase in illumination/UV. Of course, it remains to be seen if this can be accomplished with this species, though. I hope whoever buys/bought the one from Tonga reads this, or has already done their homework! The geographic range of the species (at least in the recent past) was then known to cover the Gulf of Aqaba and much of the Red Sea proper at that point, as one specimen had been collected much further south, off Yemen. However, it is now known that its range extends well down the west coast of Africa in the Indian Ocean, and is abundant around the Bazaruto Archipelago off the coast of Mozambique.14 This is almost as far south as the southern end of Madagascar. Whether its range extends even further south, and how far it extends to the east, is unknown at this time, though. Approximate geographic range of T. squamosina. Typical shell form of T. squamosina. Used with permission, courtesy of Merlin Charon. As is common for giant clams, the mantle tissue is quite variable in appearance, and bears a wide range of colors and patterns. It’s also papillose, meaning it’s covered with little knob-like protrusions. These structures, which are properly called papillae, cover the mantle and are more pronounced and numerous on larger specimens, while the mantles of T. maxima and T. squamosa tend to be relatively smooth. However, some T. maxima and T. squamosa, do bear papillae, although they are fewer in number. The inhalent siphon is ringed with tentacles, like T. maxima and T. squamosa, as well. Three specimens of T. squamosina. Used with permission, courtesy of Mrutzek Meeresaquaristik (L & M), and Nicole Helgason (R). Note that some T. maxima shells (L & M) look similar to those of T. squamosina, bearing relatively large “teeth” at the top of the shell. Some T. maxima also bear papillae on their mantle, seen as the small bumps on it (R). While T. squamosina (L) looks similar to many T. maxima, and is genetically closest to T. maxima, some do look much like some T. squamosa (R). T. squamosina photograph used with permission, courtesy of Julian Sprung. Another thing of note is that it’s typically attached to the substrate, and is found only in relatively shallow water.10 Those found off the coast of Mozambique were in approximately 2 to 9m of water.14 However, all specimens found in the Gulf of Aqaba and northern Red Sea were living at depths less than 2m.11 If this species does not live any deeper than 9m, then it has the smallest vertical distribution of all clams in the genus Tridacna, with the exception of T. crocea, which typically lives within 6m of the surface. To finish up on this species, I’ll again point out that, to the best of my knowledge, it has not been imported into the US . After communicating with several people in the trade, it apparently has not been aquacultured, either. Thus, it is highly unlikely that any will become available in the near future. However, while searching the internet, I did find a photograph at reeflex.net (http://dk.reeflex.net/tiere/2628_Tridacna_squamosina.htm) of a juvenile in an aquarium with T. squamosa. So, somebody, somewhere has had one in a reef aquarium. This site has several photographs of this species if you want to see more. While reading up on these two species, I found that researchers had done genetic testing on numerous clams in the Red Sea and in 2006 proposed that there were actually two new species related to T. maxima there, as well as one new species related to T. squamosa.17 So, we may find out that there are others there, too. Likewise, as mentioned above, there are two other new species of giant clam found in the Indian and Pacific Oceans, and have already been offered in the hobby. Again, those will be the subject of another article, though. Lucas, J.S., E. Ledua, and R.D. Braley. 1990. A new species of giant clam (Tridacnidae) from Fiji and Tonga . ACIAR Working Paper Number 33, Canberra. 8pp. Lucas, J.S., E. Ledua, and R.D. Braley. 1991. 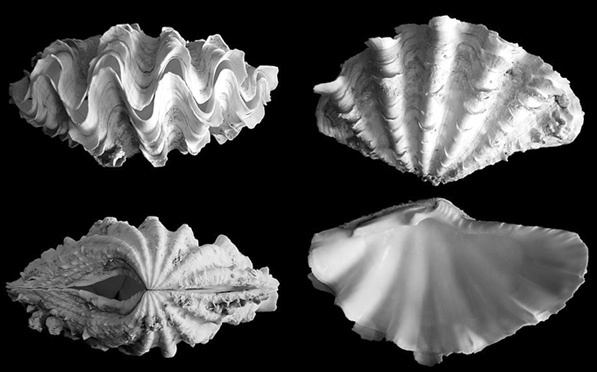 Tridacnatevoroa Lucas, Ledua, and Braley: a recently-described species of giant clam (Bivalvia: Tridacnidae) from Fiji and Tonga . Nautilus 105:92-103. Ladd, H.S. 1934. Geology of Viti Levu, Fiji . Bernice B. Bishop Museum Bulletin 119:1-263. Lewis, A.D., T.J.H. Adams, and E. Ledua. 1988. Fiji ‘s giant clam stocks – A review of their distribution, abundance, exploitation and management. In: Copeland, J.W. and J.S. Lucas (eds.) Giant Clams in Asia and the Pacific. ACIAR Monograph Number 9, Canberra. 274pp. Ledua, E., N. Manu and R. Braley, 1993. 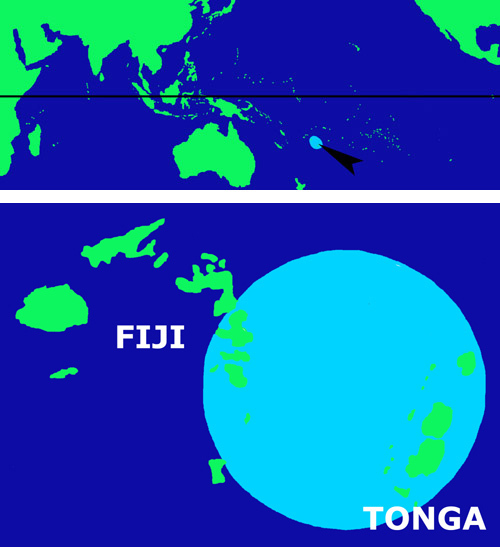 Distribution, habitat and culture of the recently described giant clam Tridacnatevoroa in Fiji and Tonga . In: Fitt, W.K. (ed.) Biology and Mariculture of Giant Clams. ACIAR Proceedings No. 47. 154pp. Richter, C., Roa-Quiaoit, H., Jantzen, C., Al-Zibdah, M., and Kochzius, M. 2008. Collapse of a new living species of giant clam in the Red Sea. Current Biology 18:1-6. Sturany, R. 1899. Expedition S.M. Schiff “Pola” in das Rothe Meer. Nördliche und südliche Hälfte. 1895/96 und 1897/98. Zoologische Ergebnisse XIV Lamellibranchiaten des ROthen Meeres. Berichte der Commision für oceanographische Forschungen. Sonderdruck aus: Denkschriften der mathematisch-naturwissenschaftlichen Classe der Kaiserlichen Akademie der Wissenschaften, Wien, 69:225-295. Huber M. and Eschner A. 2011. Tridacna(Chametrachea) costata Roa-Quiaoit, Kochzius, Jantzen, Al-Zibdah & Richter from the Red Sea, a junior synonym of Tridacnasquamosina Sturany, 1899 (Bivalvia, Tridacnidae). Annalendes Naturhistorisches Museum Wien, ser. B, 112:153-162. Helgason N., SCUBA instructor, Mozambique . 2015. personalcommunication. Kinch, J. 2002. Giant clams: their status and trade in Milne Bay Province, Papau New Guinea .TRAFFIC Bulletin 19(2):1-9. Mohamed, N.M., Hill, R.T., Kilada, R.W., Khalifa, S.I., and Abou-El-Ela, S.H. 2006. Molecular genetic analysis of giant clam (Tridacna sp.) populations in the northern Red Sea. Asian Journal of Biochemistry 1(4):338-342.